A NASA space telescope that mapped the entire sky has revealed that fewer potentially threatening asteroids are in orbits near Earth, space agency officials announced today (Sept. 29). The discovery lowers the number of medium-size asteroids near Earth to 19,500 — nearly a 50 percent drop from the 35,000 space rocks initially estimated — and suggests that the threat to Earth by dangerous asteroids may be "somewhat less than previously thought," NASA officials said in a statement. There are still thousands more of these asteroids, which can be up to 3,300 feet wide, that remain to be found. 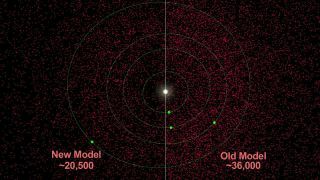 Scientists used NASA's Wide-field Infrared Survey Explorer (WISE), an infrared space telescope, to map the asteroid population near Earth and elsewhere in the solar system. By the end of the telescope's extended mission, called NEOWISE, last year, astronomers had found 90 percent of the largest asteroids near our planet, NASA scientists said. The WISE asteroid survey, which NASA says is the most accurate ever performed, also lowered the estimated number of giant asteroids — space rocks the size of a mountain — from 1,000 to 981, with about 911 of those already known, researchers said. NASA launched the $320 million WISE telescope in December 2009. It spent 14 months scanning the heavens in infrared light before NASA shut it down in February 2011.